Perennial. Zone 2. Ranunculaceae. A.k.a. 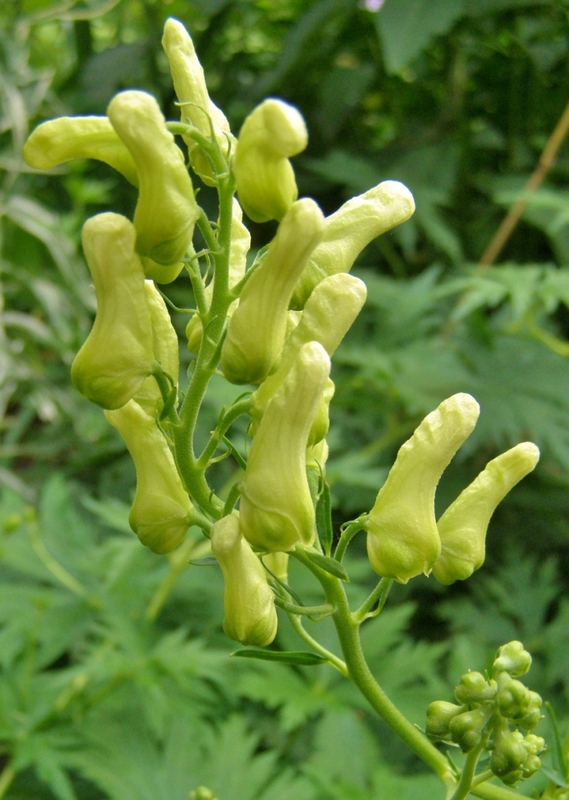 NORTHERN WOLFSBANE, FOXBANE, YELLOW MONKSHOOD. The Aconitums are in general a rather complex genus, with much natural adaptation and inter-species hybridization, so this species (or slight variations thereof) may appear under various names. A. lycoctonum is frequently thought to be synonymous with A. lamarckii and/or A. pyrenaicum and/or A. ranunculifolium (obsolete); it may also appear under the name A. vulparia. This somewhat variable species is native to Southern Europe, being found in the wild in France, Spain, Morocco, Northern Greece, Bulgaria and Romania. It grows in high-shade forest, in meadows and by stream sides, and flowers in July and August. The genus name Aconitum is thought to come from the ancient Greek village of Akonai, the site of which is now in Turkey. Nearby is a cave which was said to house the entrance to Hades, which was famously guarded by the three-headed dog Cerebus. The places where the froth from Cerebus’s maddened slavering fell to earth was thought to have been marked by these plants, which were notorious for their poisonous properties. The species name lycoctonum originates from the Greek: lycos = wolf, and kteinein = kill, which is the origin of the common name wolfsbane, as the roots were used to formulate arrow poisons, and were added to meat left out to bait wolves and foxes. The many members of the large Ranunculus (Buttercup) Family are in general excellent garden plants for colder regions such as the Cariboo-Chilcotin, and this unusual Monkshood is no exception, being hardy, attractive, and trouble free. The foliage is lush, dark green, and raggedly cut. It forms clumps to 2 feet tall and wide, from which many slender stems arise in early summer. 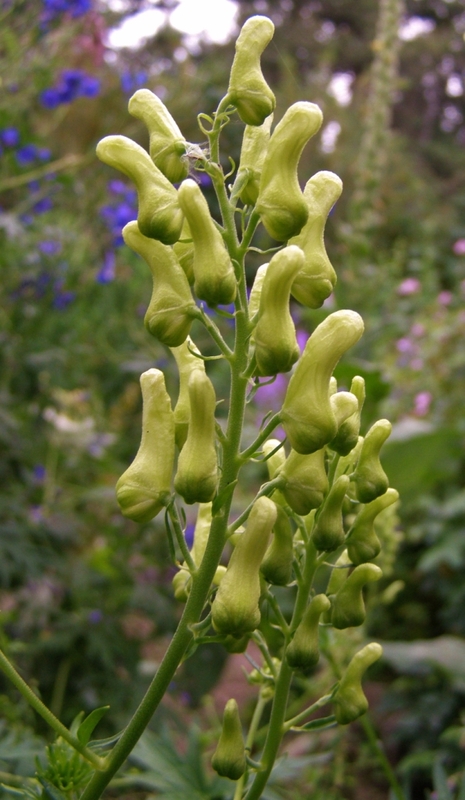 These produce clusters of intriguing greeny-yellow buds, which slowly expand into elongated, pale sulphur yellow, hooded blooms in mid and late summer. The bloom stalks tend to overbalance themselves when flowering is at its peak, so sturdy neighbours or a bit of modest staking is beneficial. 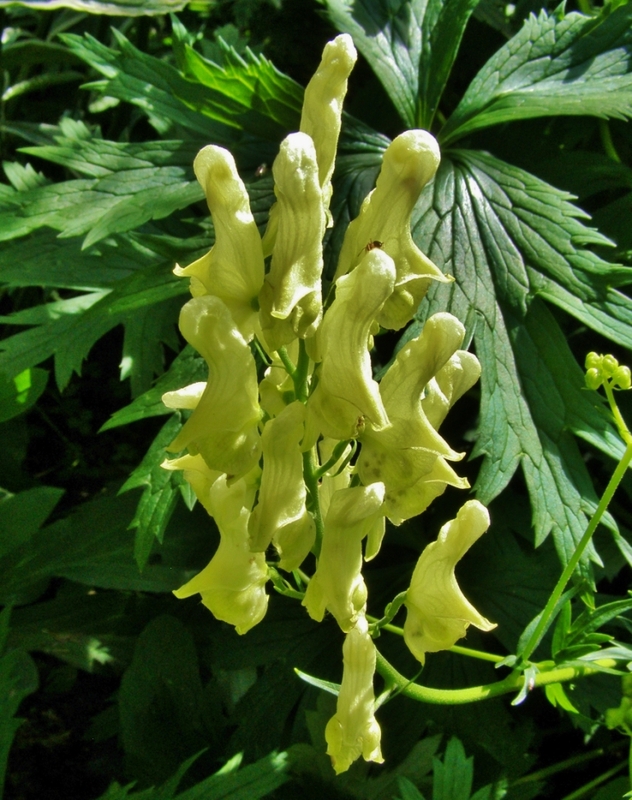 Aconitum lycoctonum may not have enough colour for everybody, but some of us enjoy the greeny cream narrow flowers, perched like birds on rangy stems. It is not a compact plant and likes to behave in our gardens as it does in its native Austria. It doesn’t take kindly to restraint, so the thing to do is to grow it with perennials with which it can intermingle and make a pleasing picture. I have it in front of tall species Phlox paniculata, which has soft lavender flowers, and behind that is a big clump of Achillea [filipendulina] ‘Gold Plate’. I share Margery’s fondness for this quietly attractive plant, and have a single sturdy clump which I rather cherish. It is very long-lived, and prefers a permanent garden spot where it can be undisturbed. I have occasionally moved my plant, and, several years ago, decided that it was large enough to divide for sale. I chopped it into what I thought were generous clumps and replanted several after potting up the majority of the divisions. While all took this treatment with fair aplomb, the pieces I replanted sulked flowerless for several years, obviously needing to get their roots well down until putting energy into blooming. The plant appears to be happy again, giving me a nice display in 2014, but I will think hard before I dig it up again. I may try it from seed in order to increase it for the nursery; there are some ripe seed heads now in October which I intend to shake out into a flat to stratify over winter. Blooming stalks reach 4 feet or so, but are rather airy in effect, so mid-border is a good location. Aconitum lycoctonum appreciates humus-rich soil and generous summer moisture. It is happy in full sun to high shade, and would be perfect in a woodland garden setting. Though one should definitely be aware of the plant’s potential toxicity, unless one gardens with small children prone to random leaf sampling, there should be no issues with using it in the flower border. The foliage is extremely bitter to taste and accidental poisonings are very rare; one would definitely notice something amiss very early on. Be careful when pruning and transplanting, wear gloves if you will be in contact with the running sap, don’t plant it in the culinary herb garden, grow it mid-border – away from small visitors and chewing puppies – and you should be fine.